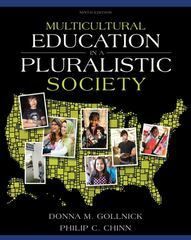 Multicultural Education in a Pluralistic Society 9 Edition This best-selling text offers a balanced approach to issues as it explores today’s multicultural landscape and how to prepare teachers to use equitable and reflective decision making in their multicultural classrooms. The ninth edition of Multicultural Education in a Pluralistic Society was designed to introduce prospective teachers to the different cultural groups to which students and their families belong. In this time of extensive standardized testing, we must remember that students are the center of teaching. We have to understand and build on their cultures and experiences to help them learn at the highest levels. In this regard, this book provides background on the diversity of the nation’s students, explores the social and educational issues faced by teachers in diverse classrooms, and guides the reader to think critically and reflectively about their decisions as a teacher in a multicultural education classroom.